It’s funny how the most recently occurring shows also seem to have been the most memorable. 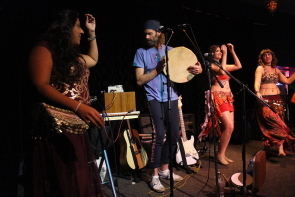 While Seas’s impressive alternative rock and punk show was a good candidate for best alternative rock show of the year on Nov. 19, Bocephus King returned to the Slice, Nov. 28 for the weirdest and most hypnotic folk show. He always makes an impression. Apparently he was just here a year ago, but I missed him. I was glad to have caught him this time. Jamie Perry aka Bocephus King, his drummer and a female dancer who only made a brief appearance on stage were just finished setting up an array of guitars, sequencers, gadgets and an assortment of drums as I arrived around 10:30 p.m. They had rushed in for the show from the middle of B.C. and made it just in time for the show. 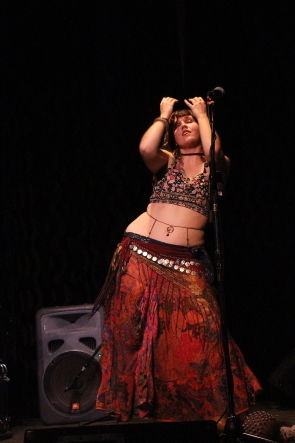 As a bonus, he recruited four local belly dancers, Maddy Young. Shelby Zuback, Kayleigh Nielsen and Pardip Athwal to seductively shimmy, shake and sway in time to his more entrancing, hypnotic, atmospheric, multi-layered trance style music. He uttered nonsense syllables for some of these stranger tracks, switching between an acoustic 12 string guitar and electric guitar plus percussion and a hand drum as the mood struck him, while adjusting buttons on machines. On the other side of the stage, his drummer kept time so carefully that it almost sounded pre-recorded. They left plenty of room for the belly dancers to weav e their way from the dance floor and onto centre stage. They were a nice touch they performed symbiotically with the music, which King changed as needed. 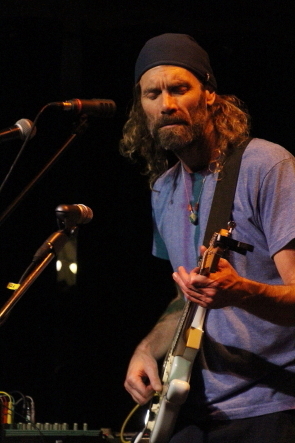 He ended his set around 1 a.m. with a more reggae influenced jam but was called back for an encore, which was one of his more uptempo bluesy numbers.